Now that ‘The Day’ (according to Jerry Nadler) has arrived, it’s time to examine whether Attorney General William Barr should release the Mueller report without redactions or whether parts of the report shouldn’t be seen by Congress or the public. Put differently, should the Attorney General follow the law or should he listen to Chairman Nadler? That question seems to tie Democrats in knots. Jerry Nadler wants everything released, including Grand Jury testimony, national security sources and methods and information about ongoing investigations. In this report, Manu Raju said that “precedent had been set by the Ken Starr report.” It’s worth noting that the Starr report was governed by a totally different law with different requirements. The Starr report was required to publish grand jury testimony. The Mueller report was required to keep grand jury testimony out of the report except if a judge ruled that testimony was allowed into the report. The special counsel law is well written because grand jury testimony is, ultimately, one-sided in favor of the prosecutors. The people testifying aren’t cross-examined. Defense witnesses aren’t usually called, either, to present both sides of the story. Ultimately, House Judiciary Committee Democrats will be able to point to the witnesses’ testimony. Republicans won’t have anything to point to. Does that sound fair? I don’t think it’s fair. I don’t think it’s even close to fair. For that reason alone, grand jury testimony shouldn’t be included. Finally, isn’t it interesting that Rep. Nadler argued against full transparency when the report involved Bill Clinton? What a pile of BS. What Ms. Pelosi means by “good faith negotiations” is that she expects President Trump to drop his funding for the wall. She and Sen. Schumer accused President Trump of wanting to shut down the government unless he got what he wanted. The Democrats’ position is just as hardline as President Trump’s. The difference is that President Trump highlighted how effective a border wall is. The difference is that Ms. Pelosi rejected President Trump’s verified facts. What’s more open or candid than a negotiation held in front of TV cameras? Frankly, Ms. Pelosi appears to want these negotiations to be held behind closed doors so she and Sen. Schumer can come out to the TV cameras and mischaracterize what was said behind closed doors. This is a picture from ISAIAH’s blog. 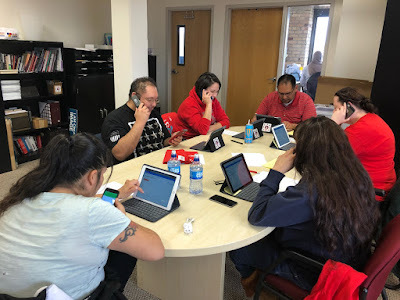 They aren’t trying to hide the fact that they’re engaging in a GOTV operation. As I highlighted earlier, the IRS has long found that GOTV operations as violating 501(c)(3) rules. I don’t know how a case could be more open-and-shut than that. According to this article, MN.IT is almost out of the $10,000,000 appropriated in late March. I’d argue that Ms. Clyborne is spending money like a drunken sailor but I think drunken sailors have more restraint. Discussions continue this week with deputy registrars, auto dealers and other MNLARS users to rank the repairs and improvements they want in the system, Clyborne said. She said the timing of the ramp-down will become clearer once the list of priorities is set. “The question is whether I ramp down in August or whether I ramp down in October or somewhere in between,” she said. That’s a 2+ month difference in “ramp-down” time estimates. If you’re spending money and that’s the best you can do in terms of pinpointing spending, then you should be fired immediately for incompetence. Republicans should be praised for getting rid of the programmers who created the MNLARS mess. Republican legislators should be further praised for insisting on rigorous oversight of the project. The MNLARS project has been a disaster from the time the Dayton administration took it over. The Dayton administration was told before MNLARS went online that it would fail. The Dayton administration ok’d the project anyway. Then it insisted on a ton more money to fix MNLARS. That took it from a $40,000,000 price tag to a $93,000,000 price tag. It’s still failing. The additional $50,000,000 didn’t fix the DFL’s MNLARS crisis either. 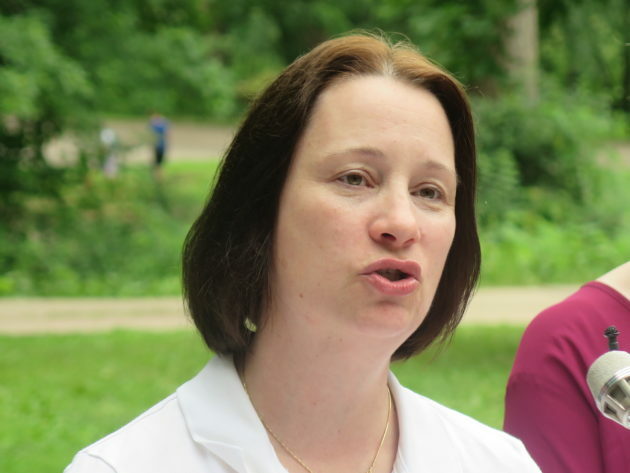 Now the DFL is insisting that Republicans will be blamed if they don’t write another $43,000,000 blank check to the Dayton administration, who will use the money to pay these failed programmers. Meantime, Dayton has proposed penalizing Minnesotans even further for the dysfunctional system with a $2 per vehicle transaction fee to go to fixing MNLARS. Not a chance, according to MNN’s coverage. House Ways and Means Committee Chairman Jim Knoblach from Saint Cloud says that’s dead on arrival. “To me it just adds insult to injury. He’s now going to try to charge everyone who uses the system to pay for this disaster. We’re not gonna do that,” Knoblach says. Chairman Knoblach is right in declaring that proposal DOA. Why should we pay for the Dayton administration’s incompetence? I’ve said it before but I’ll repeat it here. The DFL is the party of big government. Gov. Dayton and DFL legislators like Scott Dibble, Rick Hansen and Frank Hornstein have insisted that the money be appropriated but that the legislature not provide oversight on the project. This can’t be taken seriously. Republicans are right in insisting on rigorous oversight. If that costs us a few of these programmers, it’s worth it. Since July 10, 22 people have spoken about refugee resettlement. Many of the speakers said they are concerned about the taxpayer cost of refugees. Once the refugees have been here 90 days, federal funding disappears. At that point, the taxpayers get hit with the costs of supporting refugees. The same taxpayers that pay property taxes to the city get hit with property tax increases from the school district to pay for programs that help refugees learn the English language. That’s why St. Cloud’s education rating is awful. By comparison, Sartell, which doesn’t have to deal with refugees, earns a higher rating for education and for crime. Our focus is to increase communication and seek solutions to meet the needs of refugee populations. This is a working group. Quarterly meetings were never intended to be an open public forum. Thus far, it’s apparent that LSS’s focus is on keeping these proceedings secret. We know there is community interest in learning more about refugee resettlement. To create greater understanding about this work, we are opening our December quarterly consultation meeting to interested public observers. How quaint. LSS is opening up a meeting one time so LSS can say that they’ve been transparent. Resettling refugees is humanitarian work. We’ve been involved in refugee resettlement for nearly 10 years in St. Cloud, and many decades in Minnesota. Our role is to help refugees get off to a good start and become productive members of the community as quickly as possible. Actually, it’s a racket. Businesses that hire refugees who’ve been unemployed more than 6 months qualify for a tax credit of up to $9,600. Businesses hiring refugees aren’t hiring them for middle management positions. They’re hiring them for unskilled positions. In other words, businesses get cheap labor and a huge tax credit for hiring cheap labor. Schiff is the worst salesman of conspiracy theories I’ve ever witnessed. This morning, Schiff tweeted “If President personally intervened with DOJ to advance case against political opponent it’s beyond disturbing; I intend to pursue in new probe.” WOW! It’s absurdity on steroids to think that insisting on transparency would create howls of partisanship. Yes, Congressman Schiff, it’s ok to investigate a political opponent if that’s where the evidence takes you. It’s only wrong if there’s nothing pointing to a person’s political opponents. In this case, the political opponent is Hillary Clinton, the personification of political corruption. She’s a corruption magnet. On Wednesday, it was revealed the FBI informant can now testify to Congress after being released from a confidentiality agreement by the Justice Department. The informant’s identity has not been publicly disclosed because he was undercover for almost five years. During that time, he provided agents information about Russia’s atomic energy business in the U.S.
A report from The Hill last week said the FBI has evidence dating as far back as 2009 that nuclear industry officials from Russia had been involved in bribery, kickbacks, extortion, and money laundering that benefited Russian President Vladimir Putin’s atomic energy project expansion with the U.S.
As long as the administration isn’t engaging in a fishing expedition, I don’t see what the problem is. The minute it becomes a fishing expedition, though, that’s a problem. President Trump’s hands are clean on this because he’s insisting on more information and transparency rather than secrecy. If Congressman Schiff has a problem with transparency, then he’s got a problem with the American people. I can’t imagine that’s a battlefield Schiff wants to fight on because it’s all downside for him. 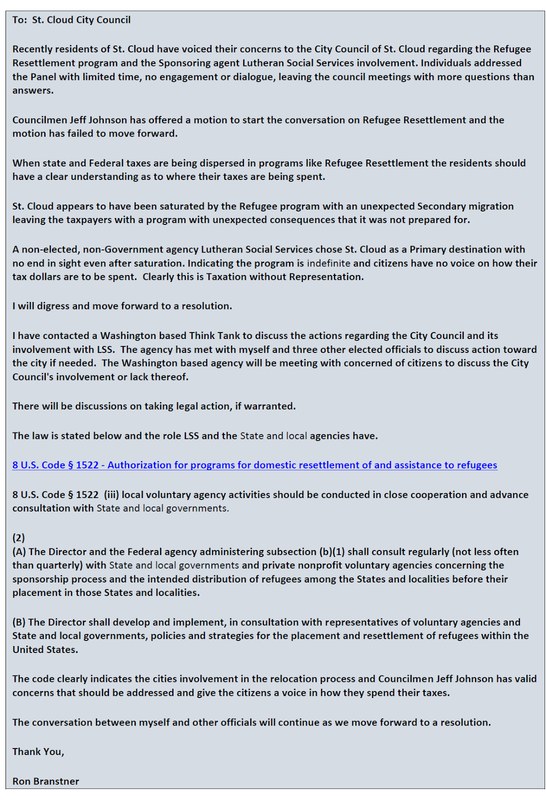 In summation, the State Department is required to regularly consult with local governments prior to the resettlement of refugees. Based on what the federal government and county and city governments have shared with the public, those consultations haven’t happened. Let’s be clear, though. It’s entirely possible that the State Department has consulted with the various NPOs about the program. That’s possible because the various levels of government have been as transparent as a brick wall. In other words, municipal and county governments and school boards must meet with the federal government and put together a plan that doesn’t overtax “educational, health care, and mental health services.” Additionally, this plan must be in place prior to the first refugee is resettled in a city. People will insist that I’m being overly dramatic about refugee resettlement. That’s fine. Some members of St. Cloud’s City Council have already suggested that people who’ve asked for information on the economic impact of the State Department’s refugee resettlement program are racists. The St. Cloud Times has accused people who have simply asked for information of being bigots or Islamophobes. While visiting St. Cloud in October, 2015, Gov. Dayton told lifelong residents that they should leave Minnesota if they didn’t accept Somali refugees. Our congressman, Tom Emmer, is disinterested in the subject. According to this KNSI article, “St. Cloud residents voiced their concerns about refugee resettlement at Monday’s city council meeting. A group of five people addressed the council asking for refugee population statistics and economic data, saying they haven’t been able to get any answers on the issue.” After they spoke, Councilman George Hontos made a “motion for a study session on refugee resettlement.” Hontos’ motion failed on a 4-3 vote. Lewis is right in the sense that the refugee resettlement program is a federal program run through the U.S. State Department. It’s also a cowardly answer in the sense that refugees use local resources like schools, hospitals and other resources. Those things are definitely within the City Council’s purview. 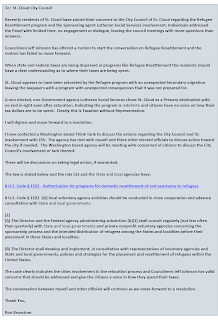 It’s important to note that this motion wasn’t on a resolution condemning the program. It was a motion to spend a study session studying the impact the program has on St. Cloud’s transportation system, schools and hospitals. Goerger, Laraway, Lewis and Libert were too cowardly to even agree to that.